A series of irrigated runoff trials tested two herbicide application methods (conventional Irvin leg and band spraying) for effects on water quality and weed control efficacy at several sugarcane farms in the lower Burdekin. Herbicides were frequently lost with irrigation runoff in concentrations that pose a significant risk to local wetlands and waterways of the Burdekin region. The greatest losses occurred on furrow irrigated cane farms during the first irrigation after herbicide application. Figure 1: Pre-emergent herbicide loads (g.a.i ha−1) in irrigation tail water following the first herbicide applications leaving a Burdekin Haughton Water Supply Scheme (top) and Burdekin Delta sugarcane field (bottom). Treatments (top): 1–Atrazine broadcast; 2–atrazine banded (high rate); 3–Atrazine banded (low rate); 4–metribuzin broadcast; and 5–metribuzin banded; (bottom) 1 (Diuron broadcast); 2 (Diuron banded); 3 (Metolachlor broadcast); 4 (Metolachlor banded); 5 (Imazapic broadcast); and 6 (Imazapic banded). Shielded (band) spraying of herbicides consistently offered significant reductions in both pre-emergent (residual) herbicide and total toxic load losses in irrigation runoff compared to conventional broadcast applications. Weed control efficacy did not vary between broadcast and shielded (band) sprayer treatments. Shielded spraying appears to offer considerable environmental and agronomic benefits to cane growers. Collective Paddock to Reef Program results highlight that many farmers who achieve effective early weed control (in fallow and planting stages) can even shift entirely away from any residual herbicide application in later crop stages, instead relying solely on shielded sprayer application of knockdown herbicides for crop weed control. Results also highlight the need for a carefully considered approach to integrating alternative herbicides (metribuzin, metolachlor) into improved pest management for the sugarcane industry. Using integrated weed management strategies that reduce rates of herbicide applied to paddocks in the long-term, while still achieving effective weed control is the safest strategy for minimising environmental risk. 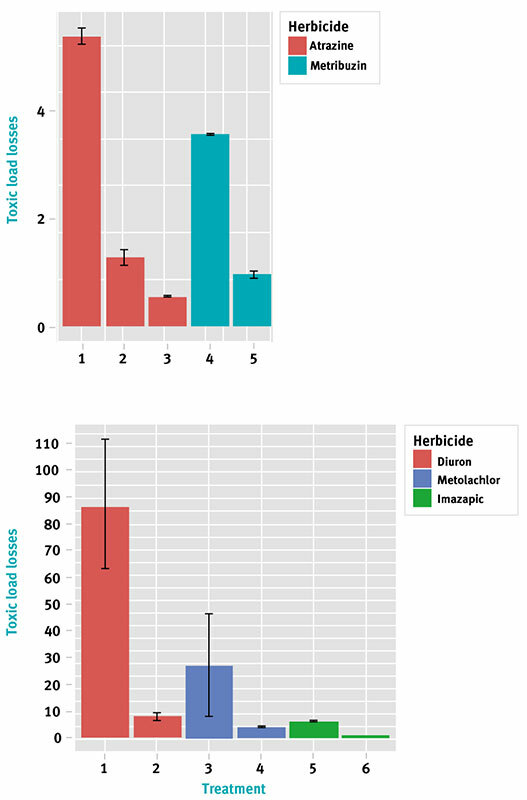 Trials compared runoff of a range of currently regulated priority pre-emergent herbicides (incl. Diuron, atrazine), alternative pre-emergent herbicides (metribuzin, imazapic and metolachlor) and contact (knockdown) herbicides (glyphosate, 2,4-D, MCPA, paraquat), applied as either blanket or banded treatments. Residual herbicides (such as atrazine and Diuron) were only applied to the plant row in the banded treatments, with knockdown herbicides used in the furrows. Herbicide runoff loads were calculated in the first irrigation following herbicide application (when the majority of herbicide losses tend to occur). Figure 2: Relative overall toxic runoff loads for herbicides leaving treatments in irrigation tailwater following the first herbicide applications leaving a Burdekin Haughton Water Supply Scheme (top) and Burdekin Delta sugarcane field (bottom). Treatments (top): 1–Atrazine broadcast; 2–atrazine banded (high rate); 3–Atrazine banded (low rate); 4–metribuzin broadcast; and 5–metribuzin banded; (right) 1 (Diuron broadcast); 2 (Diuron banded); 3 (Metolachlor broadcast); 4 (Metolachlor banded); 5 (Imazapic broadcast); and 6 (Imazapic banded). Note the large difference in the Y-axis scale between the two figures. Results consistently showed that regardless of the specific herbicide used, band (shielded) spraying in furrow irrigated farming systems provided reductions in herbicide runoff. Pesticide load was reduced by as much as 80-90%; substantially exceeding anticipated rates. (Figure 1). Herbicide banding does, however, often entail more complex mixtures of pre-emergent and knockdown herbicides being applied to paddocks than typically used under conventional herbicide application approaches. Herbicides vary in their toxicity to non-target aquatic organisms. A “toxic load” combines the loads measured and the relative toxicity of each of the herbicides in a mixture. 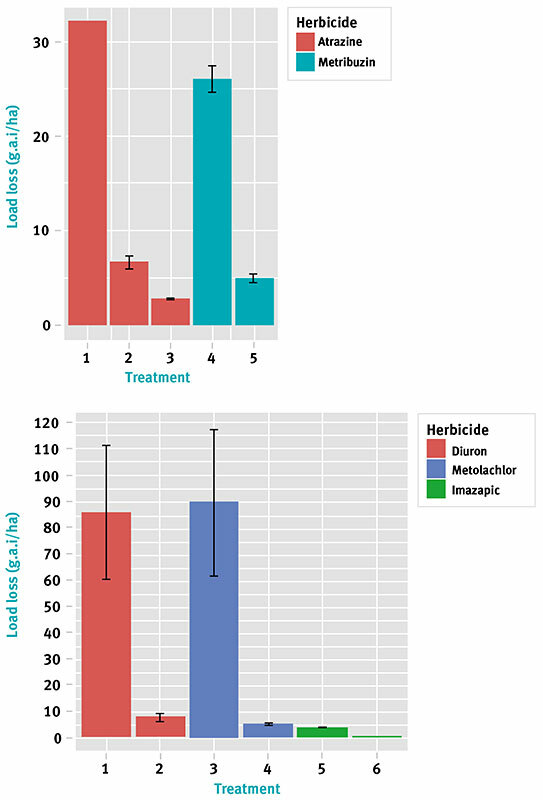 Despite more complex herbicide mixtures being applied under banded practices, banding also consistently provided greatly reduced environmental toxicity in herbicide losses from the field (Figure 2). Surveyed growers responded that band spraying and alternative herbicide use had similar effectiveness to conventional applications of priority residual herbicides. We would like to thank co-operating landholders and Burdekin Productivity Services for hosting the on-farm study, maintaining crop management records and providing ongoing support for the project. Oliver DP, Anderson JS, Davis A, Lewis S, Brodie J, Kookana R., 2014, Banded applications are highly effective in minimising herbicide migration from furrow-irrigated sugar cane. Science of the Total Environment 466–467: 841–8.